A dual-laser sensing system is under development at the Department of Energy's Oak Ridge National Laboratory. 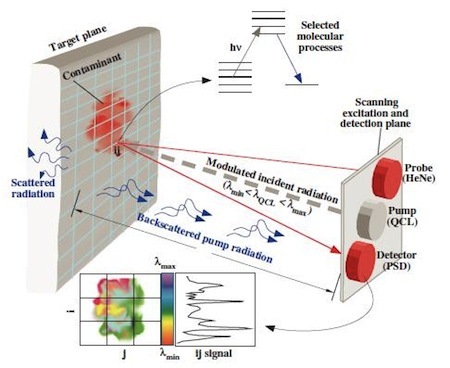 The device uses a quantum cascade laser to "pump," or strike, a target, and another laser to monitor the selected target's response as a result of temperature-induced changes. "With two lasers, one serves as the pump and the other is the probe," said Passian, a member of ORNL's Measurement Science and Systems Engineering Division. "The novel aspect to our approach is that the second laser extracts information and allows us to do this without resorting to a weak return signal. "The use of a second laser provides a robust and stable readout approach independent of the pump laser settings." While this approach is similar to radar and lidar sensing techniques in that it uses a return signal to carry information of the molecules to be detected, it differs in a number of ways. "First is the use of photothermal spectroscopy configuration where the pump and probe beams are nearly parallel," Passian said. "We use probe beam reflectometry as the return signal in standoff applications, thereby minimizing the need for wavelength-dependent expensive infrared components such as cameras, telescopes and detectors." 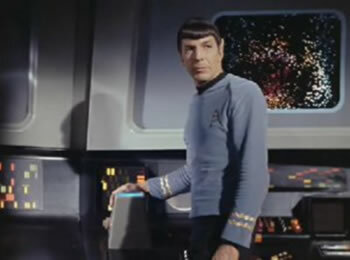 Fans of Star Trek: TOS have been eagerly awaiting long range sensor scans that can detect the components of an atmosphere without needing to send crew members in red shirts to gather samples. Via Science Daily; thanks to Winchell Chung of Project Rho for the tip on this story.